They did the dumb again didn't they? Description: This woman stands over six feet tall with vibrant green eyes and pale coppery blond hair. It is most often pulled back into a single braid and coiled on the back of her head. Strong features make her striking rather than pretty with sharp cheekbones and a rounded chin. Tall and muscular she looks like she is fully capable of picking up a soldier in full armor. Personality: Carmen is no-nonsense. She prefers to be straight forward, rarely beating around the point. Despite this she is an outgoing and warm woman. It is part of what makes her such a fantastic medic. While a little messy and scattered in her home life, everything in her professional is organized and in its place. Basically she knows how and when to let her hair down. Background: Carmen grew up in the Lower Burroughs. Her mother was a laundress for the Mercies and her father a carpenter. They did okay as families went. As an only child she often followed at her mother's heels around the House of Solace. She proved an able helped and natural caretaker as a young child. It was when her mother insisted on her getting some schooling that her sweet demeanor faded. Carmen had a very keen mind and the stupidity she saw in the classes had her speaking out. It also had her targeted by those who didn't appreciate being made a fool of. Carmen came home angry and determined to give as good as she got. Until she hit her majority Carmen's youth was full of fighting and learning. The mercies had seen her natural gift and offered to train her, which she was happy to do. Yet she had made friends during her schooling and like most kids formed her own Burroughs gang. There were times her skills came in very handy. Her parents did not approve of her gang activities. So they brought her uncle, a Blade, to talk to her. He convinced her to give the Crimson Blades a try, where she could fight -and- use her medic skills -and- get paid for it. Seemed perfect to her. The fact that the Crimson Blades were elite helped a lot. The utter stupidity of people she couldn't help but comment on was not nearly as evident. And all her trainers actually had brains so she managed to not get in too much trouble for her smart mouth. Now six years in and through several wars she has come out a veteran combat medic. Preffering to use a small bows for protection on the field, she has become known among the blades as the Bloody Mercy. She wears the nickname with pride. Adora - The most honest person in Arx. Audric - We've reached an understanding. Violet - The Crimson Blades. Period. Harlex - Oh Captain, my Captain. Isidora - Physician, princess, and mentor. Natalia - Generous Whisper knows tactics and tact. Turo - Admiral, count, mentor. Jeffeth - Knight Commander and smartest of all of us. Jacali - The apocathary with answers. Joscelin - If whiskey were a person, it would be her. Adora Oh, was she there? I thought that was a streetlight. I don't like her. Alessandro A most interesting take on what 'perception' is, but quite accurate. Alrec Have you seen her arms? Perfectly muscled. I bet she could beat Starra in a game of river. Arianna She's got guts and humor and I like a good abundance of both. Preferably wading in both at the same time but we can't always have it all now can we? Auda A sellsword, a medic. One of the most important, surely. Berenice Alas, I only saw her but briefly, but I'm always inclined to think well of people Harlex respects. And she's one of those! Berto Blind me if they don't grow 'em big in Arx. A lovely companion over a drink or two, so long as she doesn't go to puns. Bhandn I can't say I expected a greeting delivered to my arm. I wonder what made her think of that notion? Calandra A very accurate, bold shot! Clearly, this is a woman in possession of great self control, a quality I could certainly learn more about. Cristoph A good natured warrior, though I'm disappointed I didn't get to see an example of their martial prowess. Domonico Seems to be under the impression that I threw the spear for show. A mistaken assumption however. Duarte Perfectly servicable conversationalist. A touch conceited (Aren't we all?) But there's no need to parse everything. Lycenes don't typically speak in code. It's inefficient. Elgana I'm biased terribly when it comes to my little sister, Helena, but she has terribly good taste in people she knows. So it is of little wonder that I enjoyed the too brief meeting I had with this one. I look forward to seeing her again in the future and getting to know her better myself. Eurion An incredibly tall and impressive mercenary - and very friendly! Definitely an excellent drinking partner, and a lot of fun to talk to. I'll have to get her on a ship! Or, well. At least some kind of adventure. I'll have to talk to her more first though. Yep. Evaristo I owe Carmen - for helping Josie and for her verse for the song. She's an amazing woman. Faye Pleasant company, and I find her attitude entertaining. I bet she'd be fun to sit next to in a boring meeting. Gilroy Battle medic, note taker and protector of Pravus dignity. Because someone needs to. Harlex Very amenable to bein' swept off her feet--literally. The Lieutenant is one of the good ones. Harper She is TALL! Has a real fun sense of humor, too! Helena Friendly and witty lieutenant who isn't too polite to banter with royalty -- always welcome! Ian Eager. Hope it doesn't get her killed. Isidora Tall. Very tall. Hope she likes to learn stitching. Jacali I like that one, I do. Strappin' lass, her, with questions aplenty. World could do with more askers, might make it a brighter place, and let's face it... it's lookin' a bit dim out there. Joscelin Striking, hilarious, and incredibly tall. Legs for days, and a snarky sense of humor for eons. Kaia A extremely tall, charismatic and very polite medic. She seems pleasant to be around with. Kaldur A dry and welcome wit among unbearable irreverence. Kenna Oh I like her attitude. That smile is infectious too. I'm glad she's come to be our liaison. Lianne Easy company in casual circumstances. I wonder how well that cleverness translates elsewhere. Lorenzo A practical woman but pleasant company. I look forward to running across her again to talk more. Maru This woman was completely unfazed by my bluntness. That bodes well for future conversations. Merek I met this mercenary while I was shopping. She seems nice enough. Likes weapons! Michael Tall. Armored. And very willing to have an arguement with whoever wanders by. Mikani A sister from another mister. Maybe one day she will realize it's true. Until then drinks! Miranda A humble woman who is studying under my sister-by-marriage, Isidora. Of course, she must be better than she admits, for Isidora would let her tend to me and my brother! High praise indeed! Niklas Fast with a pie. Perhaps faster eating it than running with it, tho. Oswyn An excellent companion, and one I can easily put my trust in. She reminds me of everything good about the Lowers - the spirit, the humour, the strength. Perronne Wow, she's really big! She seems nice, though, in a rough-and-ready sort of way. And hey, she patches people up, and that's always very useful! Pharamond She seems to enjoy a good fight - I like that in a woman! Reese welcoming, friendly and a medic. Seems like a good person to know. 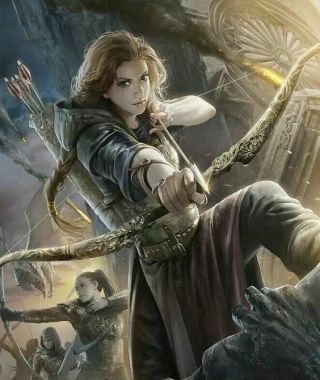 Rinel A bowwoman in /Baroness/ Violet's employ. She seems forthright in her nature. I bet she and Violet get along well. Sabella I didn't know Jeffeth had a sister! Shard The first time I heard her name, she was insulting my company. I mean, that's not to say some of the things she said didn't have some truth in them. But since then, the tiny amount we've interacted has been...polite? Let's go with polite. Sparte Sharp soul and a sharp quill. Quite the combo. Tabitha My gosh, she's so tall! And what a nice person too, and delightfully quick-witted! Thesarin Tall woman. Soldier to the core, to what I've seen. Tris Seems like a bigger personality confined to the consideration of having things well thought out. Hope she didn't lose too much on her losing rider. It's too nice an evening to start sour. Turo A woman with promise. If she can get out of her own way, she might even make a good captain. If. Valenzo Can't help but admire the first person who decides a party needs a fight, and proceeds to crack some skulls. It just ain't a party without one!! Vayne A humourous partner to have while observing a pillow fight. I hope she enjoyed seeing so many pillows destroyed. Venturo Anyone who has won the favor - especially to the point of being a protege - of the Guild Mistress is someone in high esteem indeed. It was a pleasure making the acquaintance of this Crimson Blade. Vincenzo Blood red steel, a hint of linen. Tall. Common as the day is long. Eager to please. A fighter. Kind. Might be good to know her. Interesting. Vitalis I find myself at ease in most situations, and I do enjoy some banter, but I find the people I am most at ease around are no-nonsense types. Like Carmen Harol. Willow Maybe the tallest woman I have ever met. Gorgous and a great runner though.